At Blue Future Partners, we have a long history of investing in both real estate and technology. We therefore have a keen interest in the amalgamation of the two fields, also known as PropTech. So we decided to take a closer look at specific opportunities in this very wide field by looking at the history and various applications of PropTech. With the advent of the digital revolution, practically all industries have experienced a large scale shake up, and the real estate industry certainly was no exception to this. The very first PropTech companies produced bulky software aimed at large construction or real estate enterprises which required an extensive customization from the receiving parties and were mostly focused on the analysis and management of real estate portfolios. Later, the first PropTech startups focusing on B2C were founded — mostly online search engines for properties up for sale, rent, etc. which effectively allowed the general public to view the properties on the market without the need to physically visit agencies. Some of them have become household names in respective countries, such as Trulia in the US and Rightmove in the UK. From then on, PropTech branched out into different areas, and the industry is now as diverse as the real estate market it supports, and has now branched out to incorporate e-commerce, social networking, and other sectors. PropTech can broadly be defined into three sub-categories, classified by the service it provides, Real Estate Fintech, Shared Economy, and Smart Real Estate. Real Estate Fintech refers to software and platforms that enable or aid the process of real estate transactions, and certainly the aforementioned real estate search engines fall under this category. However, the sector has grown to include a variety of different services, that include purely researching and gathering information about real estate all the way to executing real estate transactions. Shared economy is a separate industry in its own right, but has been an extremely important part in the real estate sector, with prime examples like Airbnb and HomeAway. Smart Real Estate refers to buildings with smart technology implemented inside to allow for a more efficient management of the properties in question. 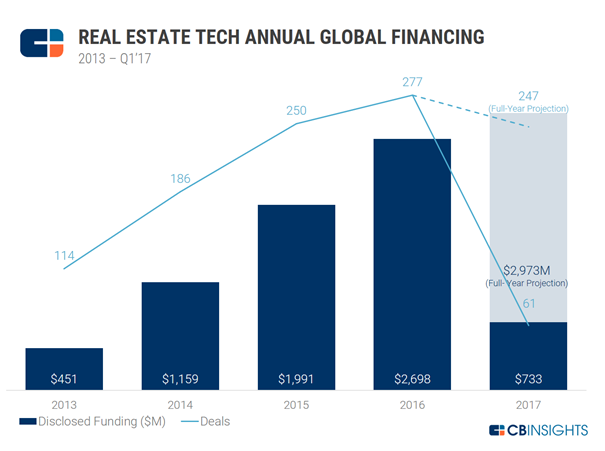 Since 2013, there has been a surge in both the number and size of the deals in the PropTech sector, with the total funding size having increased from $450m to nearly $3bn in a period of 4 years. For family offices and high net-worth individuals (and obviously real estate asset managers and companies) the PropTech sector often overlaps with existing property holdings, as in most cases they have at least some exposure to real estate. Thus, given the significant scope for synergies we have observed an increasing interest in dedicated PropTech-focused VC funds from those investors. Fifth Wall Ventures — founded in 2016, raised its first fund amounting to $240m in 2017. The notable aspect was that half of the funding came from strategic investors from the real estate industry, including real estate services and investment firm CBRE and Lowe’s, a home improvement chain. Camber Creek — the corporate venture arm of Berman Enterprises, acts as a separate VC-investment arm of its parent company, a multigenerational real estate investment company. We feel that the implementation of PropTech solutions by real estate operators is still at the beginning. But no doubt we will see the real estate industry benefiting from significant efficiency improvements from the use of technology.